Queenstown has again been named New Zealand’s number one destination in the 2014 Travellers’ Choice Destinations by TripAdvisor, the world’s largest online travel community. As well as taking out the top spot in New Zealand, the four season lake and alpine resort was also rated the second best destination in the South Pacific, after Sydney. The Travellers’ Choice Destinations awards honour top travel spots worldwide based on millions of reviews and opinions from TripAdvisor travellers. Award winners were determined based on the popularity of destinations, taking into account travellers’ favourites and most highly rated places. Destination Queenstown CEO Graham Budd was delighted with the recognition and said it was a fantastic achievement for the resort. "We’re aware of the power of Trip Advisor in influencing the travelling community, so the news that Queenstown has been ranked as the best in New Zealand, as well as number two in the South Pacific by millions of travellers is a testament to the quality of our operators and the exceptional travel experience they deliver." The cosmopolitan resort town, famous for its spectacular scenery and huge range of world-class experiences, has previously earned international accolades from other travel authorities and has now achieved this top New Zealand TripAdvisor rating for three years in a row. For the complete list of 2014 Travellers’ Choice Destinations winners, go to http://www.tripadvisor.com/TravelersChoice-Destinations. 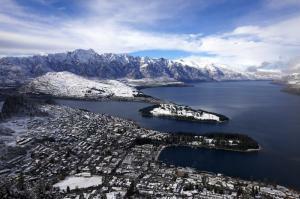 For more information about Queenstown please visit www.queenstownNZ.co.nz.